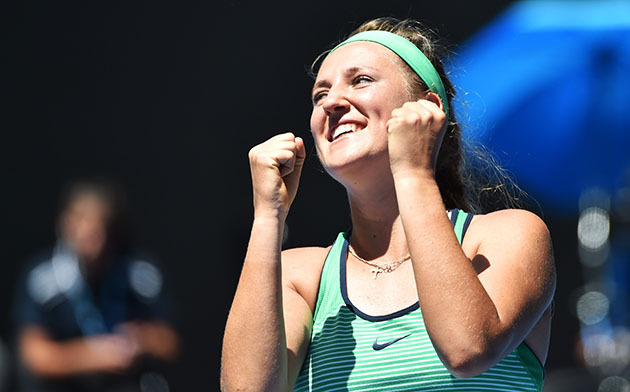 From the Players' Box with Victoria Azarenka: After attending Super Bowl 50, Azarenka describes the lessons learned from the game about an athlete's emotions and life experiences. On Feb. 7, I had the most amazing experience attending the NFL’s Super Bowl 50 in Santa Clara, Calif., and it ultimately turned out to be a phenomenal learning experience for me. I watched every move the athletes made, both before and during the game. My observation in short: During the warm-up, there was such a different dynamic at the opposite ends of the field. On one side, the Denver Broncos seemed locked in and ready while on the other end, the Carolina Panthers appeared to be hyped and relaxed, but something told me they really were tight and extremely nervous. As the game began, the Broncos stayed consistent with my pre-game analysis—they were ready for whatever came their way—but the Panthers’ lack of experience during the challenging moments on the big stage began to show. Even though their talent wasn’t destroyed, their weaker emotions were exposed. This step was vital for me—I put myself in someone else’s shoes and really tried to understand the reason for their actions and their personal situation. Most importantly, I learned to forgive emotional mistakes.